PHILADELPHIA -- The NFL is a fickle beast, isn't it? One season your biggest concern is picking a touchdown celebration, and the next you're being twisted into knots and getting run over by the wheel instead of looking like the one who invented it. Welcome to the Philadelphia Eagles' 2018 season. An offense that ranked second in points per game last season at 28.6 is currently 25th at 20.6. The Eagles have failed to hit the 24-point mark through five games -- something they did an NFL-high 12 times during their Super Bowl run in 2017. Unable to get their offensive engine humming, they have fallen to 2-3 and face a critical game Thursday night against the New York Giants in the Meadowlands (8:20 p.m. ET, Fox). Per ESPN Stats & Information, Philly is the fifth reigning Super Bowl champion since the playoffs expanded to 12 teams in 1990 to go under .500 through the first five games. Only one of the previous four such teams -- the 1996 Dallas Cowboys -- rebounded to make the playoffs. Most of the central cast members have returned and the Eagles are still led by the same aggressive, offense-minded head coach in Doug Pederson. What has changed? How much falls on the shoulders of quarterback Carson Wentz? And is there reason to be hopeful about a turnaround? Pederson's mantra heading into the season was "Embrace the Target." He wanted his players to understand they would get the opponent's best shot, week after week, as defending champs. It goes for coaching as well. "Each year you're going to study the team, whether it's an offense or defensive structure that had success the year before," Pederson said. "Everybody wants to see what worked and see if it fits for them. Obviously, studying us and looking at some of the things we did, they've had a whole offseason to prepare, a training camp to prepare." One key component to the Eagles' offense is the run-pass option, or RPO. Opponents had few answers for it last year. If the defender they were keying dropped into coverage, the quarterback would hand it off to exploit the numbers advantage on the ground. If he committed to the run, the QB would pull it and throw it behind his ear to the open receiver. All day. Nick Foles rode them through an improbable playoff stretch that ended with him being named Super Bowl MVP. The champs' offense has not resembled the explosive unit from last year through five games. Though RPOs seem to be less present in the Eagles' offense this season, Pederson says he is still calling them, but most are resulting in runs now because of adjustments defenses have made. "Teams are just defending it a little bit better," he said, "and we just continue to evolve a little bit and find answers moving forward." There are a few methods that are proving effective in combating the RPO. One is moving cornerbacks tight to receivers at the line of scrimmage. If a defensive back is playing off coverage, it's much easier to connect on a quick slant or stop route. But if they're playing press, there's less of a window. The counter to that would be to hit defenses over the top, but the Eagles are short on vertical threats since Mike Wallace went down because of a fractured leg, compounding the issue. According to one high-ranking offensive coach, teams are blitzing the gap -- often vacated by a pulling guard -- to hurry the decision-making process. And coaches are teaching backside defenders to stay home and take away the quick pop pass rather than chasing the run away. "Don't give them the open window, because that is what the RPO is designed to do," former defensive back and ESPN analyst Matt Bowen said. "What you tell them is, we'll take away one from the run front, we'll sacrifice that, so we don't give up the backside pop pass because it's such an easy throw for quarterbacks." The Eagles' first play of the game last week against Minnesota was an RPO. Alshon Jeffery was blanketed at the line of scrimmage, Wentz had nowhere to go and nearly threw an interception trying to zip it in to Jeffery. 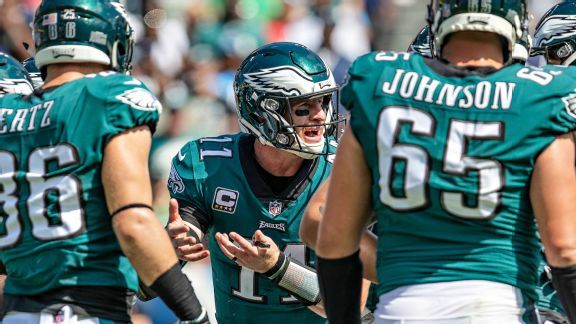 "It's still something that we'll always have in every week, it's just whether we're calling them so much or not," Wentz said. "It's a big part of what we do. It's just throughout each game, sometimes we use it more if it's working well, and sometimes we get away from it." Left tackle Jason Peters made an interesting comment following Sunday's 23-21 loss to the Vikings during which Wentz absorbed three sacks and eight quarterbacks hits. Carson Wentz is taking a lot of punishment for someone returning from devastating knee injuries. Here's a look over the past three games. "Right now we're struggling on the offensive line because we have to block longer," he said. "We have a quarterback that's coming off of an injury and he wants to make a play. We just have to block longer in order for him to make a play. We just have to be better in pass protection." The eye test and the film backs that up to a degree. There are definitely plays when Wentz holds the ball longer than he should, or goes for extra bases when the right decision is to check down and take the single. Wentz doesn't dispute any of that. "It definitely happens. It's kind of the nature of my game that I think I bring," he said. "You're always trying to weigh the pros and cons of doing that, and sometimes it gets you, sometimes it ends up being big plays as well. I would say that's a fair statement." The numbers, though, show that Peters' theory doesn't fully hold water. Wentz is right in the middle of the pack when it comes to hanging onto the ball. He is averaging 2.76 seconds to throw this season, according to NextGen stats, which ranks 14th in the NFL. The average time across the league is 2.73 seconds. Wentz's numbers are up only slightly (2.72) from last year. Nick Foles, meanwhile, averaged 2.98 seconds per throw in relief of Wentz this season, which is fourth highest. And yet Wentz is getting crushed. He has been sacked 12 times and has taken 27 hits in three games since returning from a serious multiligament knee injury. So what gives? The line, for one, needs to own its part in this. Regarded as one of the best units in the league, the line's play has been down across the board. Right tackle Lane Johnson's dip in play is a microcosm of what's ailing this entire team: He was impenetrable last year but has given up strip-sacks in back-to-back games, including one Sunday that was returned 64 yards by 330-pound defensive lineman Linval Joseph. Pederson, though, has not been doing Wentz or that offensive front any favors. Wentz is averaging 41 dropbacks per game. The pass/run ratio has been 85-39 (69 percent pass) over the past two weeks. "Carson is still a young quarterback and he is still developing," said Seth Joyner, the former standout linebacker for the Eagles and current analyst for NBC Philly. 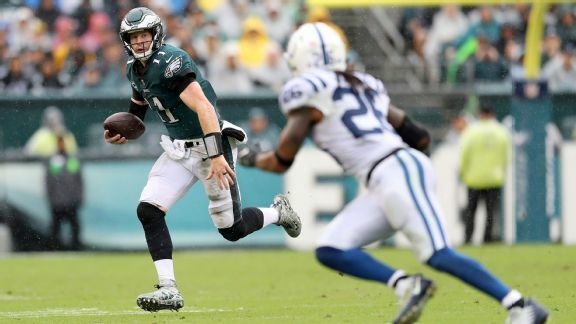 "Doug can do him a world of good by just running the football, establishing the run, and when he does that, it's going to open up a myriad of things in the playbook for Carson, for his true talents to be realized, and it's going to help his development. "There will come a time in his career when you can lay the entire offense on his shoulders and on his arm and say, 'Go out there and make it happen.' But I think he's still developing to that point. Until we realize that we've got to use the running game and use the strength of our offensive line, which in my opinion is the running game, to do that, he's going to have brilliant moments and he's going to have moments of struggle." That's exactly what it has been for Wentz through three games. He's completing 67 percent of his throws (up from 60 percent in 2017) with five touchdowns and an interception, and has shown good mobility despite wearing a large brace around his surgically repaired left knee. He has also had moments when he has looked rusty, and with defenders coming over the walls, he has been charged with too many negative plays. Jay Ajayi also wondered why the Eagles aren't running more after only five running plays in the first half of Sunday's loss to Minnesota. "With the offensive line we have on this team, running the ball like that, that doesn't make sense to me," he said. When reporting that the Minnesota Vikings were hiring Eagles quarterbacks coach John DeFilippo to be their offensive coordinator back in February, ESPN's Adam Schefter wrote on Twitter, "Super Bowl brain drain underway in Philadelphia." A few days later, offensive coordinator Frank Reich was hired to be head coach of the Indianapolis Colts. Mike Groh replaced Reich and Press Taylor took over the QB room for DeFilippo. Both are highly thought of around the league, and their arrows are pointing up. But it is fair to wonder whether losing two coaches who were so critical to the operation last season has hurt the 2018 Eagles in the early going. "You've got a guy with great credibility in DeFilippo and a guy who’s lived the game and coached the game at the highest level in Frank Reich. I just don't believe that those two guys can walk out of that organization without there being some residual effects to losing those guys," Joyner said. "I think that Frank Reich has always been a voice of reason in the ear of Doug Pederson on game day. Does Mike Groh and Press Taylor really hold that cachet in Doug's ear? Is he listening to what they say? Are they saying the right things? Are they advising along the same lines as John and Frank did last year?" One of Pederson's greatest strengths is that he empowers his assistants. Reich and DeFilippo were given responsibilities over different parts of the offense related to situational football. DeFilippo, for instance, had a hand in tailoring their red zone offense. The Eagles ranked second in red zone efficiency last year (64 percent touchdown rate) and are 18th through five games this year (53 percent). It's a similar story on third down. They were second in 2017 (45 percent conversion rate) compared to 23rd this season (38 percent). There's much more to it than a change in a couple of offensive coaches, but it's probably fair to say there has been an adjustment period. That goes for the whole team. The Eagles went from underdogs to the hunted in the blink of an eye. They switched quarterbacks three weeks in. Wentz is reacclimating to the game post-op. Defenses are playing them smarter. And the Eagles are fighting to regain the same level of mental focus they sustained through their championship run, even though their bodies and minds had less time to refresh than most. The Eagles also have suffered several injuries with Ajayi (torn ACL), Wallace and Mack Hollins (groin) being put on injured reserve. Running backs Darren Sproles (hamstring) and Corey Clement (quadriceps) also have been unable to stay on the field, and Jeffery has played in only two games after returning from shoulder surgery. But the system is not broken, and there's reason to believe this once-high-flying offense will get back on track. "The scheme is fine. The scheme is the same thing Matt Nagy is running in Chicago. The scheme works. There is no doubt about it," Bowen said. "Right now you want a coach calling plays who is a part of the Andy Reid coaching tree or the Kyle Shanahan coaching tree based on what I'm seeing on film. Those are the most prolific offenses and the toughest to defend. "The talent is there. And Carson is fine. ... You have to give him more clean-pocket throws. If there's clean-pocket throws, that offense is going to take off with Coach Pederson. It's not the scheme, it's a lack of efficiency right now from the players, in my opinion."